When drugs shift from being a source of fun to a source of trouble in the minds of their users, the change can leave people in a very lonely place. Changing habits and a way of life is never easy, and when those habits are fueled by addiction, it can be even harder. This is why people fighting to end their addiction turn to treatment centers for help. They understand that they cannot do it alone. However, they are never alone in making this choice. According to data shared by the Coalition Against Drug Abuse, 23.1 million Americans needed treatment for drug abuse in 2010, almost nine percent of the population over the age of 12. Among those 23 million Americans, three million found the courage to take the first steps towards recovery by seeking treatment. Drug addiction treatment centers specialize in providing the medical and emotional support people need in order to follow through on this important and life changing choice.Few people start as heavy drug users. At first, the high comes quickly, and the person learns to love it. They want to have that feeling again, and that leads to more drugs, and gradually more, always trying to regain that experience. Unfortunately, as the body adapts and builds up a tolerance, it will take more of the same drug to achieve the same level of high, or an even stronger drug. The more a person wants the drug, the more their body begins to require it, and the further they fall into the vicious cycle of addiction and abuse.Drug abuse does not just happen with the illegal drugs, such as cocaine, marijuana, heroine, or meth. Many of the people who are checking into drug addiction treatment centers had abused prescription drugs by taking them for non-medical reasons. In 2011, Vicodin and Adderall were the third and fourth most commonly abused drugs after regular and synthetic marijuana. Many people, especially teenagers, are under the impression that prescription drugs are safer than other kinds because they can be bought at a pharmacy. Sadly, this is not true, and the number of people dying of an overdose because of the abuse of prescription drugs is rising. There are many consequences of drug abuse, and these can encourage people to seek out the drug addiction treatment centers as a way of getting back to health. 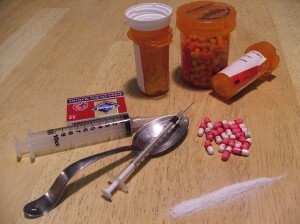 Drugs can cause many dangerous side affects, including death, and increase the risk of heart attacks, panic attacks, and other long term problems. Family and friends are often hurt emotionally or physically by drug abuse, and this is often instrumental in inspiring people to reach out and seek help for their condition. The great danger of addiction is that even as the problems grow, the drug user cannot simply stop using them because the body has developed a higher tolerance and need for them. This is why anyone wishing to break free should contact a drug treatment center for emotional and medical help.